Try our FREE outdoor kitchen design service. You’ll get an exact quote per your project’s specifications. Look at these real customer projects with pricing. We’ve shared a variety of actual customer projects, design documents, and cabinet cost. Yes. They are made from solid marine-grade High Density Polyethylene (HDPE) which is 100% impervious to water. The cabinets can be completely soaked. Do the cabinets have sealed doors (with a gasket)? No. They are not watertight. They are waterPROOF. There is a difference between those terms. Water will do nothing to harm the structure or integrity of the cabinetry. While the gaps are very small between the doors and drawers, they technically are not gasketed with a watertight seal. For most applications this is plenty sufficient to keep your items safe from the weather. Are the cabinets made from PVC? No! Werever’s outdoor cabinets are made from High Density Polyethylene (HDPE), not PVC. PVC is lighter and weaker than HDPE. It is brittle. PVC has to be painted because is not UV-stabilized. Make sure you’re not shopping for PVC cabinets incorrectly assuming they’re the same as Werever’s HDPE cabinetry. 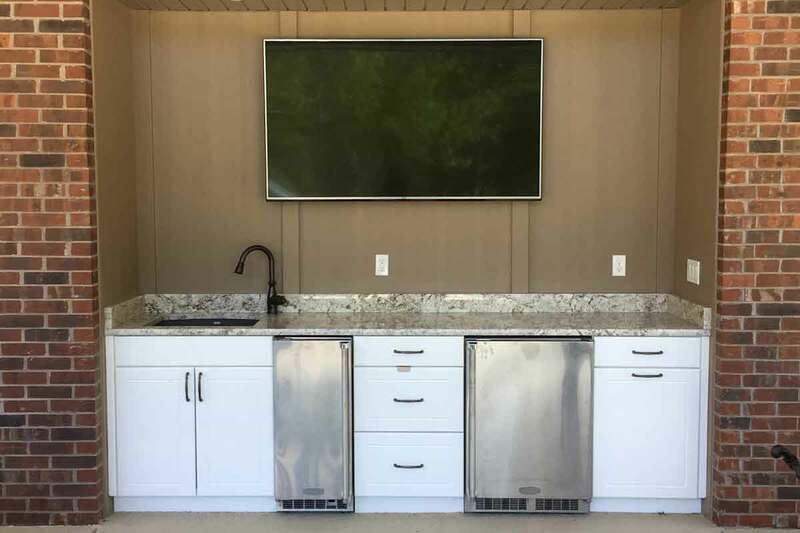 Read more about why you should not buy PVC outdoor cabinets. This term is a generic marketing phrase that doesn’t mean anything specific. 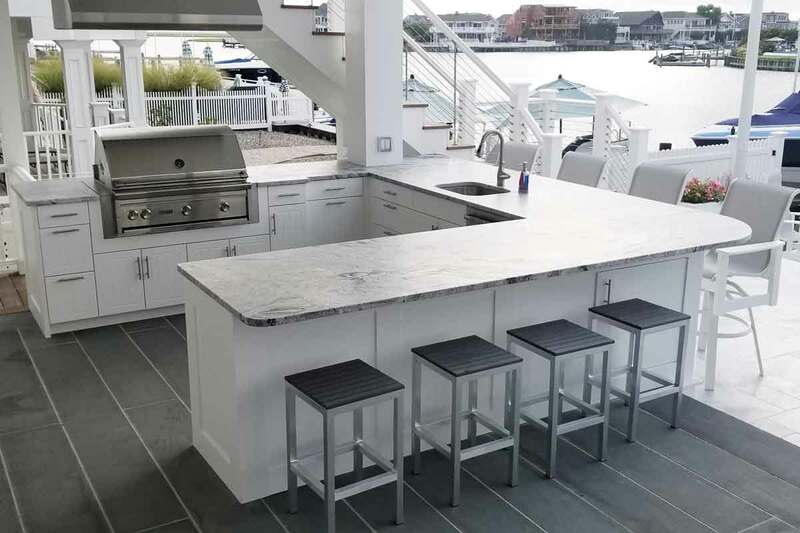 Many things that are called “Marine Grade Polymer” are unsuitable for building outdoor cabinetry. To get a better understanding of this term, read more about polymer. How do Werever cabinets differ from competing cabinets? Werever’s proprietary construction methods are unique within the outdoor cabinet industry. Interior cabinet construction techniques don’t work well when building outdoor cabinets due to temperature changes, UV exposure, moisture, etc. Read this page for an overview of our construction methods. Can these cabinets go outside in direct sunlight? Absolutely! They are specifically designed with a permanent, UV protected HDPE material engineered to withstand the harshest outdoor elements. They are UV stabilized for direct sunlight exposure. You don’t have to do anything to protect them from the sun. By comparison, PVC cabinets do not withstand direct exposure to the sun without a painted-on protectant. Be sure to read the fine-print if you are comparing Werever to PVC cabinets. Other manufacturers actually caution against putting outdoor cabinetry in direct sunlight! Can Werever cabinets be installed on casters? No. While technically you could swap the leveling legs for casters, Werever does not recommend using our cabinets to build a movable island. The cabinets are too heavy to make it practical to move. Since an important aspect of installing any cabinetry, indoor or outdoor, is to make sure they are perfectly level, casters are not a good idea. Werever does not warrant cabinets that have been modified to be installed on casters. Can I get these locally? 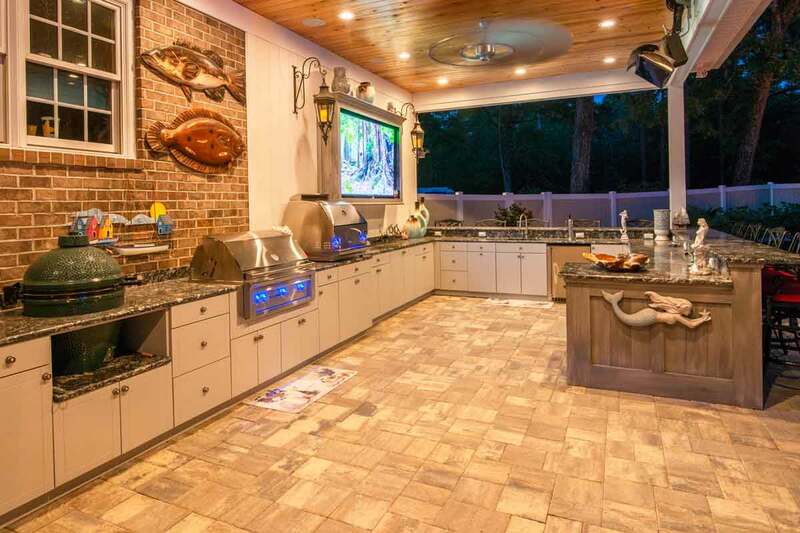 We ship beautiful outdoor kitchens nationwide, every day. We build our cabinetry with computer-controlled machinery, so our cabinets fit exactly. You can also contact us to find a dealer in your market. What kind of grill should I use? You must use a grill with a factory-manufactured insulated liner (or heat jacket). For your convenience, Werever does offer a full line of outdoor appliances, but you are welcome to purchase your grill elsewhere. Werever recommends Lynx Grills for the best fit and finish, customer support, warranty, and cooking features. Your order will ship approximately three to four weeks from the date you place your order. The shipping time may vary slightly depending on seasonal demand. If you are planning around a specific schedule, we can help! Please ask your sales professional for current production lead times. If you need a guaranteed ship date, please notify your designer and ask for a “Commitment Date”. Are Werever cabinets easy to install? If you can operate basic hand tools such as a drill, a level, screwdrivers, and perhaps a circular saw if you have to trim a filler, then yes, these are easy to install. If you are not comfortable with tools, you would be better suited to hire a handyman to help install these cabinets. Each cabinet arrives fully assembled, countertop ready. Cabinets easily attach to walls with screws, and attach to each other with stainless-steel bolts (provided). Be cautious when buying “outdoor” cabinetry without a leveling system. There are options on the market that have nice pictures, but they make for an almost impossible real-world installation if you aren’t installing on a perfectly level surface. 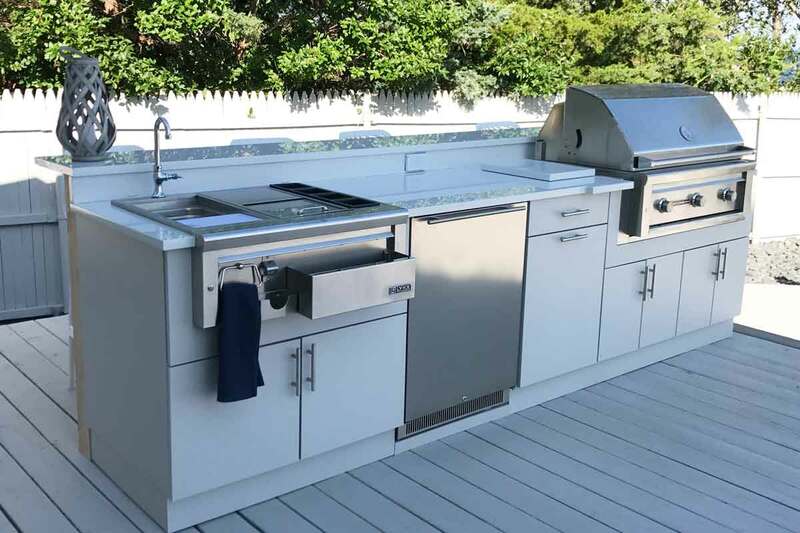 Unlike interior kitchens, outdoor kitchen spaces are typically sloped for drainage purposed intentionally. In a clinical, marketing picture of other outdoor cabinet systems you won’t see this issue. In the field, it will be a nightmare to resolve. Werever has taken that problem out of the equation. No. A proper fitting countertop needs to be templated on site based on the exact installation. For that reason, we don’t provide countertops. You can use granite (recommended), acrylic (Corian), quartz (Silestone or Zodiaq). All of these are available at Home Depot, Lowe’s, or from any local countertop company. You can use our free design to shop price for your countertop locally. You’ll find that the countertop company will price the project based on the design, but they’ll want to come on site once the cabinets are set and make a precise template. Within our local market we can help with installation services. We may have a dealer in your area, so please call to ask. These cabinets are an easy do-it-yourself project. Or, you can have your builder or handyman handle the whole project on your behalf. The majority of our cabinet projects are installed by people using our cabinetry for the first time… and these projects are always successful. 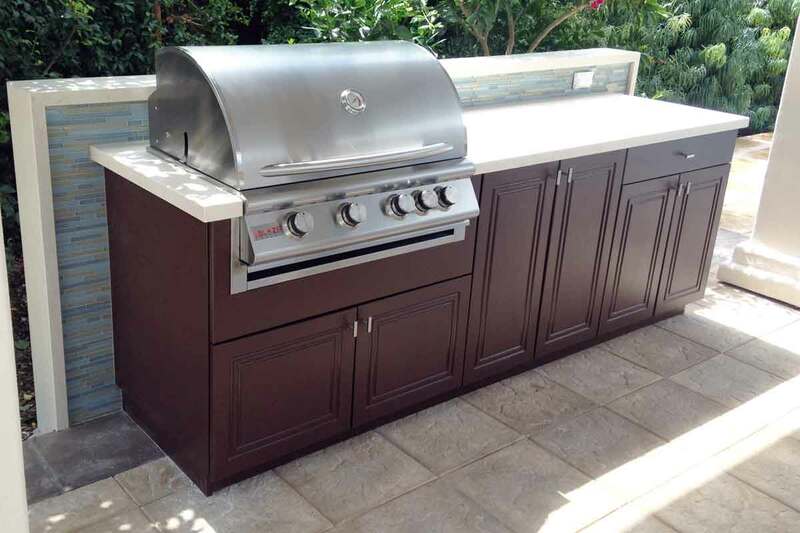 You can look in our photo gallery for step-by-step pictures of an outdoor kitchen installation. Read Werever’s Installation Instructions for more information. How are Werever cabinets shipped? Cabinets are shipped fully assembled. For more information about pallet size and weight, read about our shipping details. 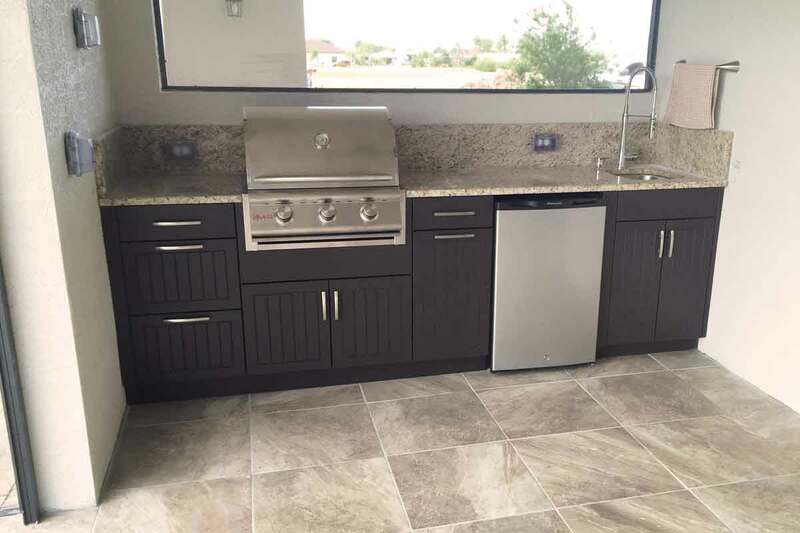 Why should I buy outdoor cabinets from Werever? If you’re unsure about buying out-of-state or even sight-unseen, we understand your concern. We also know how happy you’ll be with your purchase. We have been in business since 2001 building one thing, HDPE weatherproof outdoor cabinetry. We have serviced thousands of customers across the country and beyond. This is our only line of business. It isn’t some new trial venture or secondary product line. We are focused and committed to providing world class service and a best-in-class product. Copycat competitors have come and gone. Their warranties are now worthless. We will be here through the entire process and beyond. If you have concerns, call or email us. We can even put you in contact with a happy customer near you that can share their experience with you first-hand. You are not our guinea pig or experiment project for us to try to figure out what we’re doing. We’re the best in the industry and have a proven track record. Here are some of our Google reviews from real customers. If you have any other questions we can answer, email info@werever.com or call (888) 324-3837 for a quick answer.